The attention to naturalistic human anatomy in the statue is extraordinary. One of the most spectacular recent finds from Crete is this statuette of a youthful male figure made of gold, ivory, serpentine, and rock crystal. 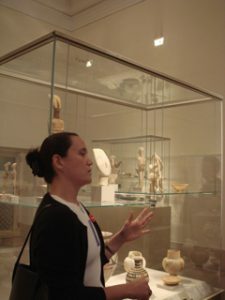 It is one of only a small handful of Minoan sculptures in the round, and the largest ever found. Although it is not complete, much of it is in excellent shape and its naturalistic style is striking. It is often called the Palaikastro Kouros, as it is similar to the later Archaic Greek statues of idealized youthful elite males. 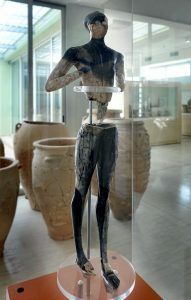 The figure was found in the excavations at the town of Palaikastro, a large archaeological site on the East coast of Crete known for, among other things, the creation of especially fine Marine Style pottery which was traded all over the island as well as throughout the Mediterranean. The statue was discovered smashed into hundreds of pieces, spread over two areas 10 meters apart, the result of the looting and burning during the town’s destruction at the end of the LM Ib period (1450 B.C.E.). 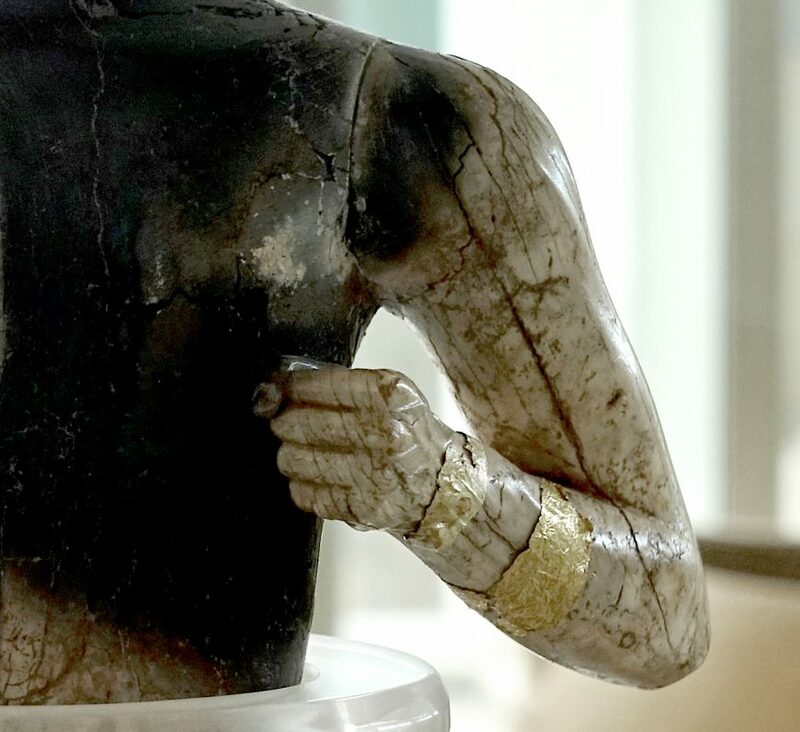 After painstaking efforts, the figurine was reconstructed to show an athletic young man standing with one foot slightly before the other, knees locked, both arms bent, hands in fists held up to the chest. The figure’s head is turned very slightly to the left, with hair cropped short except for one lock running down the middle of the scalp from front to back. The figurine was constructed of eight separate pieces of hippopotamus ivory and was fitted together using wooden dowels. The hair was carved from a piece of serpentine stone and the eyes were inlaid with rock crystal. Sadly, the face of the figure as well as his middle section is lost; much of the surviving ivory was burned black, although still in remarkably good condition. There is evidence that the figurine was partially covered in hammered gold: specifically, the feet and part of the lower leg, the lower arms (possibly in the form of bracelets), as well as the lost middle section, likely to look like a loincloth. Although it is hard to guess where this piece would have originally been viewed, it is clear that it was inserted into a base, which would have allowed it to stand up straight. Careful analysis has shown that the base itself was as opulent as the figurine, made from a combination of Egyptian blue and gold. The attention to naturalistic human anatomy in the statue is extraordinary. The smooth shape and musculature of the chest, legs, and arms is highly accurate. In the feet and hands, the details of veining and even the cuticles of the fingers and toes are breathtaking to behold. However, this singular anatomical detail is not, in fact, accurate. For instance, the veins on the foot do not reflect real human vascular systems. Similarly, the thumbs of each hand are rendered too long, and curl over the knuckles of the remaining fingers too far. This uneven realism is actually a hallmark of Minoan art. Whom does this statue represent? There is no way to know exactly. Surely it was an important figure, given the precious materials and refined skill used to create it. The archaeologists who excavated the statue at Palaikastro believe that it represents the Bronze Age forerunner of the later Classical youthful male god of the underworld, come to herald the beginning of the harvest in the fall: Diktaian Zeus. What does this extraordinary statue tell us about the Minoans? At least two things. First of all, it tells us about a special relationship with Egypt. The two most valuable materials that make up the statue are hippopotamus ivory and gold, and both of these materials came from Egypt. Moreover, the stance of the figure (one foot in front of the other with locked knees) imitates the classic stance of Egyptian statuary. Lastly, art historians believe that the figurine employs a variant of an early Egyptian proportional canon. Therefore, much of how this figurine was conceived and produced is owed to Egypt. We might view this as evidence of a close trading relationship and likely some sort of cultural affinity as well. The second thing the Palaikastro Kouros can tell us about the Minoans is that they were the first to create chryselephantine statuary. Chryselephantine statuary is best known from the Classical Greek era, the most famous examples being the statues of Athena and Zeus at Athens and Olympia, respectively, both created by Phidias in the 5th century B.C.E. Early examples on a much smaller scale have been found at Delphi, but this figurine from Palaikastro is the earliest known example of this important sculptural type. This entry was posted in Art History, History, Minoa. Bookmark the permalink.